At Car Finance BC, our credit specialists are sensitive and understanding when it comes to an individual circumstance relating to less than favourable credit. Having worked closely with a long line of our customer’s in similar situations, we clearly recognize that people make mistakes and studying previous credit history is not always an accurate way to judge as to whether an application should be approved or not. 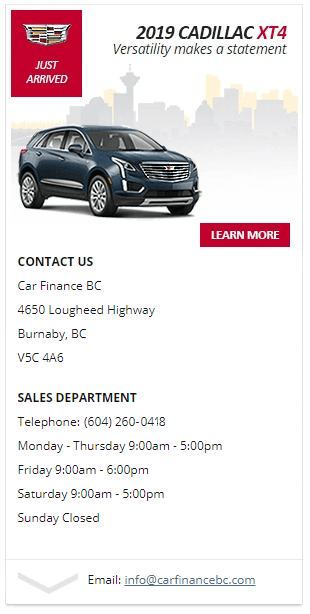 Furthermore, for customers who may have had their loan application previously rejected with a financial institution – you’re always welcome to apply for a sub-prime car loan at Car Finance BC instead.